What is a "Rip Current"? A rip current is a seaward stream. It is caused by an excessive amount of water that has come inside a sand bar over which waves have broken shore ward. This accumulation of water becomes higher than sea level and flows seaward through deeper areas where waves are not breaking ashore. Rip currents are visible from shore. There are several "signs" that they exist. Look for the following indicators to determine their location:triptideSandy-colored areas. 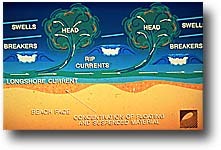 This indicates that a rip current is forming by 'washing-out' sand from the bottom as the water flows seaward. Dark-colored water. This defines the deeper areas. Slots of darker water indicate where rip currents have already formed. A line of seaweed, foam, and/or debris extending seaward. You are witnessing items brought over the sandbar with the waves washing back out to sea with the rip current. An area of confusing waves. This choppy area resembles the surface water inside a washing machine. Rip currents are not always easily discernible to the untrained eye. An experienced ocean lifeguard with an elevated vantage point, will know where the rip currents exist. This helps them direct bathers away from these dangerous areas. Always swim in a guarded area. When is it conducive for rip currents to exist on beaches? Anytime waves are "breaking" toward shore, that volume of water must flow back out to sea by gravity. A "breaking wave" is a wave in which water (white in appearance) is physically moving toward shore. It is caused by water spilling or plunging down the wave faces. A "swell" on the other hand, is only a wave energy form; that is, water moving on a vertical plane (up & down) rather than forward. A swell may become a breaking wave when it reaches sufficiently shallow waters. Most waves are formed from the force of wind against the water. Sometimes waves travel thousands of miles across open seas from storms. Usually, however, local winds cause waves at our shores. Therefore, one may expect rip currents on days with strong onshore winds. How would some one caught in a rip current free himself? Rip currents may become strong enough to pull the best of swimmers seaward. The best method of escape would be to swim perpendicular to the pull of the current, then swim to shore with the shoreward waves once significantly free from it's effects. It is important to move a considerable distance from the rip current so as not to be fed back into it from the lateral (parallel to shore) current. Even with this knowledge, it may not be as simple as it sounds. For your own safety, it's best to swim on a guarded beach.